Se você utilizou os itens comprados com "Pontos de Justiça" em Dalaran para upar a reputação de "Os Filhos de Hodir", você não conseguirá interagir com os NPCs. Para que você consiga interagir e adquirir os itens que esta reputação oferece para venda, como por exemplo o Rédeas do Mamute de Gelo , você DEVE fazer a sequencia de quests para liberação desta facção. Começando por Levaram nossos homens! que é a primeira de uma sequencia de 16 quests. Após esta sequencia, você iniciará a A última da espécie outra sequencia de 8 quests. E após esta sequencia, você fará a O fogo do refinador que terá também a Uma centelha de esperança logo em seguida. O que você pode fazer é pegar exalted através dos tokens que se compra com pontos de justiça em Dalaran, e depois fazer a sequencia de quests. È necessário fazer as quests para ver o quartermaster não basta ser exaltado. Comenda dos Filhos de Hodir can be purchased from Magistra Vergara in Dalaran for 16 JP. Without the JP guild perk, Cata heroic bosses drop 70 JP, and of course, there are several of those bosses in each instance. On top of this, Justiça Seja Feita will increase your JP gains by 7 per boss, which is half of a commendation badge right there. She sells rep badges for the other main Wrath factions as well; getting Exalted with all of them should take less than a day. 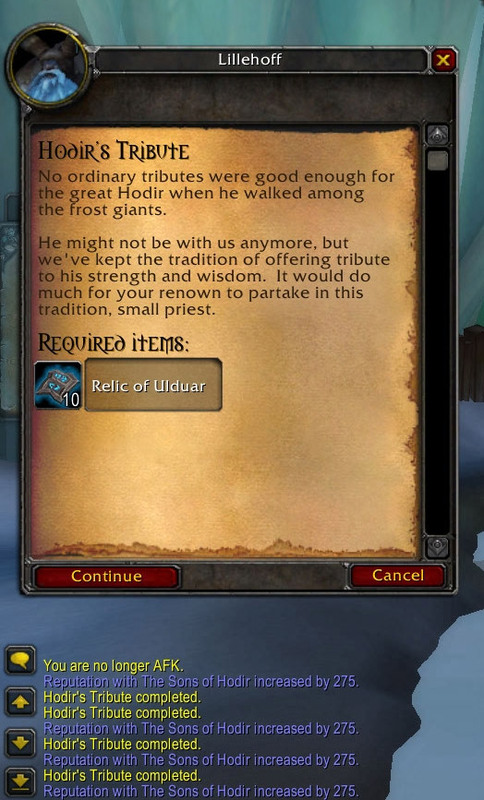 If you're short a tiny bit of reputation before hitting Exalted, or you just don't feel like running any more dungeons, Relíquia de Ulduar is usually on the Auction House in limited quantities, but isn't cost-effective. If you're level 85 and you haven't done the Halls of Lightning quests yet, I highly recommend doing them to build rep. When I started working on the Sons of Hodir, I was already halfway through revered just from completing the quests in the Storm Peaks. I'm not sure how many times I did the dailies to get there, but I don't think it was more than three times. Yesterday, I had 14000 of the 21000 rep to be exalted. I did all of the dailies once first, then I ran Halls of Lightning, did the quests associated with it and turned in the Relíquia de Ulduar I had gotten (which ended up being over 150) and got the 7000 rep I needed. The nice thing about running HoL is that the relics dropped frequently, and the mobs who dropped them always had more than one. I'd say about 60% dropped and they usually had 3 or 4 (with some exceptions, obviously). Its easy now if you have some justice points lying around, just complete the quest chain starting with Levaram nossos homens! and after completing it just go to dalaran and visit one of your old justice point vendors they sell badges that give 520 rep for 16 justice points. By just doing the required quests that opens up Sons of Hodir as a friendly faction (Fazendo as pazes and Uma centelha de esperança), I hit revered, with the guild perk as my only rep boost. (he's in the dalaran sewers!, next to exit pipe) and he gives you Refúgio exuberante! If you didn't bother to read any of the guides and just thought that you'd get neutral by finishing sibling rivalry then here's a heads up. In addition to that you also have to do O fogo do refinador in order to get to neutral/honored. After I finished that quest chain I went up to honored. Os gigantes de gelo dos Picos Tempestuosos são um povo guerreiro que vive em Dun Niffelem.